While the HTC press event earlier this morning all but 100% confirmed LTE support on AT&T, T-Mobile and Sprint — a new sign-up page posted by T-Mobile makes it absolutely, positively the real deal. The One marks the first HTC device to support LTE on T-Mobile and will be among the most powerful devices T-Mobile has available right from the start of their LTE rollout. Along with the Note II, Galaxy S III LTE, BlackBerry Z10 and rumored Lumia 810 support, Magenta’s LTE launch is already shaping up nicely with powerful and exciting handsets. So th, build it and they will come aspect seems to be working, minus the build it part…for now. Cool. Two devices advertised to support LTE. Still no AD on the Revamped Samsung Galaxy S III LTE? Since I didn’t get the 4.2.2 upstate yet, I assume I’m going to be able to run LTE Advanced on my LG GN4. cool i wonder if there gonna have a page like this for the iphone 5.
whats up with these new smartphones with non-replacable batteries? one of the reasons i wasn’t a fan of the iphone. Can extend the battery but now that’s too late. Oh well right. Men, at least I will be able to run LTE. My battery lasts just fine on my 4, you may be doing something otherwise to affect it. I can go a full day and still have juice. That’s because of design. Both HTC One and iPhone 5 are made from 1 piece of aluminum, inside they put motherboard with battery and cover it with display. Probably for the same reason they didn’t wanna do extra cut out on the side for the memory card as it would not follow the design. LG Optimus G pro or HTC One. None of them are keeping me from getting the Note 2 when the next sale rolls around. Only thing that might is a Phablet nexus phone. note: google should only do that if they keep the current form factor as their flagship. Nicely done HTC… However…the hype machine THAT IS the S IV and GNote3 will be coming hard and add to the fact that Verizon (the dipshits that they are) has bowed out makes it probably the best phone NO ONE will ever hear about. It didn’t help that you (again) have difficulty naming devices. You release a phone 9 months ago with the “One” series moniker and then proceeded to throw the entire alphabet behind it. One X, One S, One XC, One SC, One XT, One V, One X+… (see below) and then you come out with the ‘One’. WTH are you guys doing?? When will OEM’s learn not to make a phone JUST for Verizon. They get you to make a phone for them to tag ‘Droid’ all over it and then they tell you we don’t need you anymore… Stop making deals with them. They get what everybody else gets or they get nothing…!! HTC is awesome but there’s a lot of devices going to compete for the crown. HTC’s HTC One, Samsung Galaxy S IV, Samsung Galaxy Note II, IPhone 5S or 6, Motorola X, Nexus 5, Sony Xperia Z, Blackberry Z10, Hussein Ascend Mate. I’m sure there are more companies out their waiting to confirm these phones to be their flagships and push them out in the market. But HTC made one good device. 4.7″ with a great camera and good battery with great internal storage. Let’s see if Samsung will still have their crown. Such an exciting year for all! I forgot about the LG Optimus G Pro. Lol. Looks like Verizon pays a lot for the exclusivity and orders big amounts of phones. It’s not their fault, it’s their competitors’ fault for being slow. How many customers did tmo lost because of not supporting and not getting iPhones? I wish it were that easy. Unfortunately Verizon is the big dog in the US. To get the HTC One in most people’s hand in the US, you need Verizon. That’s why they have major pull on the manufacturers. Since HTC is not as big as Samsung or Apple, they have no upper hand in this matter. At least HTC got 3 of the 4 major carriers. Maybe Verizon will cave in eventually, but the will still find a way to change it up. Like they did with the Note 2. Not a hardware change, just a gross Verizon logo on the home button. So yeah, HTC’s naming convention is stupid. People don’t keep track of letters when shopping for a phone. In contrast, Samsung’s naming convention is stupid easy to understand. I know what the Samsung Galaxy S is, and I know where future models are in the pecking order because there’s the II, III and upcoming IV (or 2, 3, or 4 if one is not into the Roman Numeral thing). Update: As I am typing this all that are visible are the comments. I can’t see the article, meaning that even after reading the article I don’t know the what THIS HTC One is called. Is it the “One” without a letter? Or is it called “The One.” Either way, whoever is in marketing is stupid, stupid, stupid. I long for the day when we can pick and choose the hardware/software features of our phones. Now they need to actually provide a sizable LTE footprint so people can actually use these devices. From what I’ve learned today they are having some massive problems with their LTE deployments in Las Vegas and Kansas City. RF issues and lack of sufficient backhaul problems galore! -deviating from android.. trying to mix windows and android.. even though not everyone is on board yet.. what are we? beta testers? -no wireless charging.. u put it on the dna/butterfly.. but not this… wth? -4.7″ screen? why not 4.3? why not 5? why the awkward middle? Gotta see when it comes out. People say it looks and feels really good. – akward button? I had the same on my HTC desire. You can live with it. I’m waiting for iPhone to be released, once this happens no other phone will matter anymore! HTC enjoy it while you can, not much longer! T-Mobile can’t put its logo or any bloatware on the iPhone. Apple does not allow it. HTC took Apple to school on this design as the 5 should have been more like this, but instead looks rather unremarkable. Well done HTC. Should be interesting to see how the software runs. I prefer stock and love my Nexus 4, but this looks like a beautiful option to the plastic slabs out there. This will probably be prone to scratches but options to protect abound. Me too ill be getting the att version. then why are you even here ? Hmm because I want to ? And can do whatever I want? Maybe that’s why ? my biggest problem with htc is that they don’t really update soft wares even for their “high-end ” phones people are stuck on the version they bought the phone. Looks like this phone is coming at us with a list price of aprox $799. In a T-Mobile non-subsidized world that means $300 down, and $20 a month for 2 years. BTW I’m basing the list price on an article on Android Central that it’s up for pre-order in the UK for £519 which translates roughly to $799. The BS of the MSRP is going to have to fall before T-Mobile’s non-subsidized model has a chance (at least with high end phones). 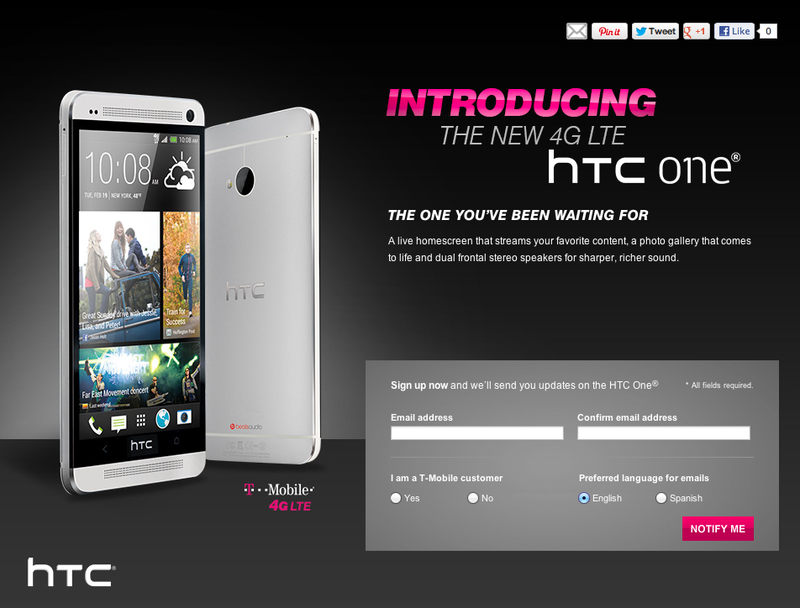 As I’ve said before T-Mobile is likely to become the home of lots of bottom feeder and midline Android phones. I just bought a blu studio 6.0 LTE Will let you know if it works on tmobile next weem when I recieve it!